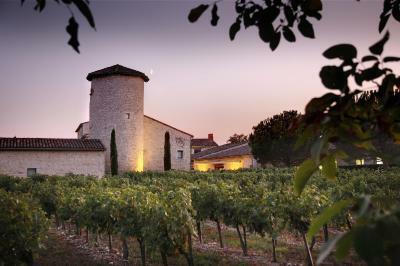 Lock in a great price for Château de Salettes – rated 8.8 by recent guests! The old castle which was left unaltered at the outside. The hosts were lovely. You can tell they really have put care and attention to detail in trying to please and accommodate their guests. 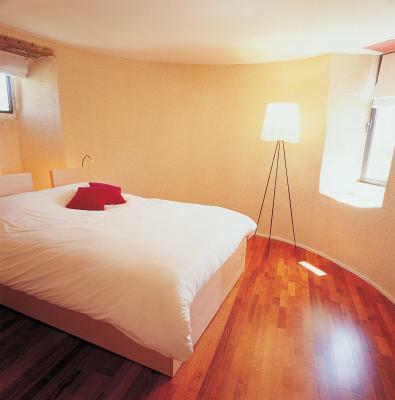 You feel as if you are guests in someone’s home- it just happens to be a 13th century chateau! You are truly transported back in time staying here. I would highly recommend staying here to anyone who is looking for an authentic chateau experience. Our bathroom was beautiful and practically as big as our bedroom! Property all in all is really special. Wonderfully quiet location but bedroom layout strange, with the lavatory in a separate room the other side of the bed from the bathroom. No drawers and not enough flat surfaces, anywhere for books, suncream etc. Hard bed. 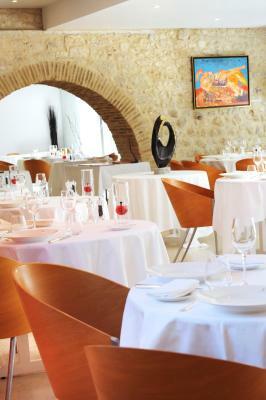 A beautiful setting, staff were friendly and helpful. Pool was great. Staff was kind and welcoming. Cleanliness and comfort was to the top standard. Beautiful landscape all around the hotel, it was so nice and quiet- perfect for a romantic getaway! We really felt like we were the only two in this beautiful castle. Room was nice and spacious, and the bed was unbelievably comfortable! Amazing dinner and house wine, the real French-style. Kind and friendly staff. What a wonderful place to stay. 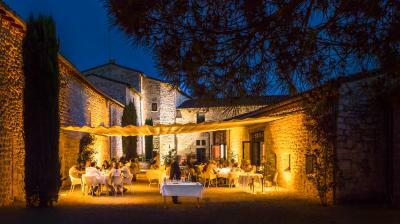 We spent most of our time attending a wedding at the next chateau but it was a great place to relax. Sadly, we did not have an opportunity to eat at the restaurant as it does not open until 7:30pm and that was too late for my toddler. 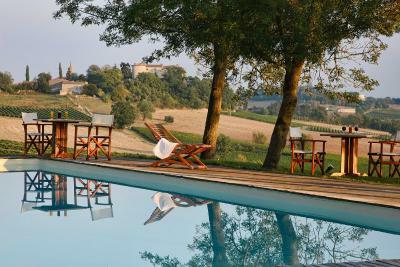 This property is located in an absolutely stunning locale - a beautiful chateau amidst vineyards and sunflower fields. The drive up to the hotel alone was heavenly, as was the view from the pool. The rooms are small but functional. The dinner we had was especially good. Because we only stayed one night (Sunday) and there was no wine tasting that day, the sommelier offered us a wine tasting at dinner. We only wish we could have stayed longer! We stayed for one night while on a long weekend exploration of the area. The staff were excellent. The Sommelier gave a great wine tasting (every evening at 6:30pm) and then gave great advice on wines with our dinner. The staff in the restaurant were also very friendly and helpful. Our lovely welcome and the room was very nice. 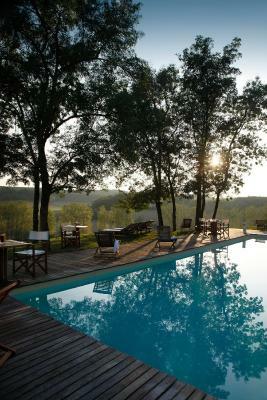 Beautiful setting with stunning outdoor swimming pool. Located in the heart of the Gaillac Vineyard, Château de Salettes dates back to the 13th and 15th centuries and features air-conditioned rooms with views of the Tarn countryside. There is an outdoor swimming pool and a terrace with sun loungers. 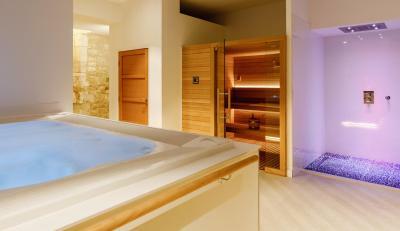 At an extra cost, you can enjoy a well-being center which features a sauna, hot tub, massages and various treatments. 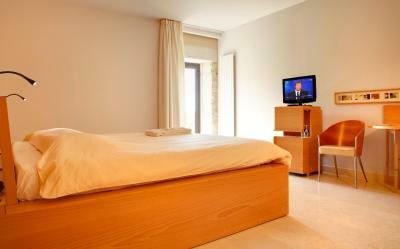 All rooms are spacious and decorated in a contemporary style. 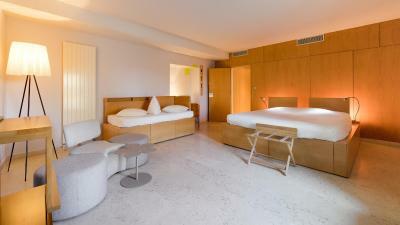 Satellite TV, free Wi-Fi access, air conditioning and a mini-bar are provided in each of the guest rooms. Private bathrooms include a bathtub and a hairdryer. 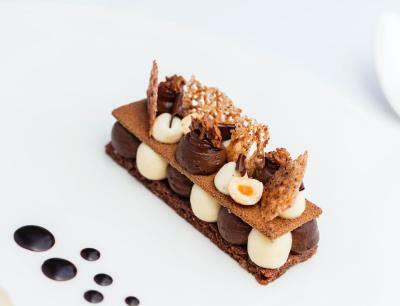 A cooked breakfast is offered daily and evening meals, prepared with traditional, regional produce are available at Château de Salettes's gastronomic restaurant upon prior booking. 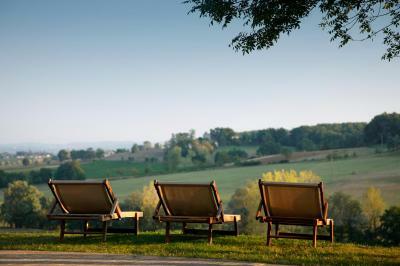 In the summer, guests can dine outside on the terrace, which offers views of the vineyards. Every evening, at 18:30, a wine tasting is offered. Free Wi-Fi access is available from the public areas of Château de Salettes. Free parking is provided for those exploring the Midi-Pyrénées region by car. Chateau-de-Mauriac is 0.6 mi away and the fortified town of Cordes-sur-Ciel is a 15-minute drive away. Albi is 16 mi away. 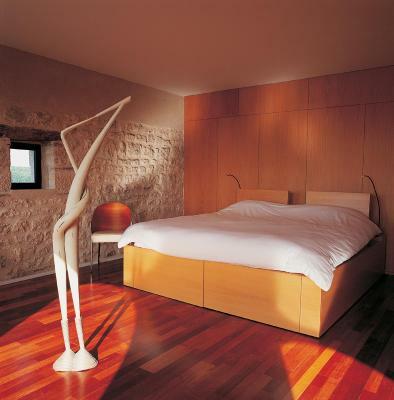 When would you like to stay at Château de Salettes? In the heart of the thousand years old vineyard of Gaillac, the Château de Salettes’s walls tower in the middle of its vines. A XIIIth and XVth century building full of character and charm, the Château de Salettes was the house of the youngest branch of the Toulouse-Lautrec family then of the d’Hautpoul family. 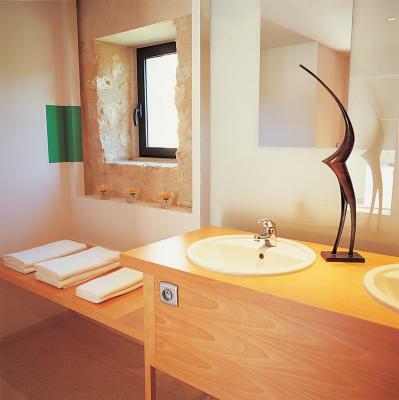 Today property of the Le Net family, renovated into a charming hotel-restaurant, the Château de Salettes has kept the authenticity and the soul of an exceptional place. 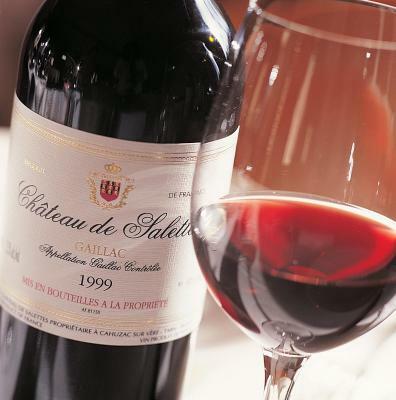 House Rules Château de Salettes takes special requests – add in the next step! Château de Salettes accepts these cards and reserves the right to temporarily hold an amount prior to arrival. The heated swimming pool is open from May to September. Please note that guests wishing to eat lunch or dinner at the restaurant must reserve a table in advance. Availability is not guaranteed. Great pool, although we wish it were more heated as it was a little cold. We were told we could use the jacuzzi and such facilities but turned out they were at an additional cost. The bath was a little tricky to take a quick shower in as we had water spilling everywhere, but still good nevertheless. Quite a few wasps beside the pool. Could have done with more pillows on the bed (I could have requested them but did not bother). The breakfast was a expensive at EUR19, especially if you just want some toast and coffee. The room could have used another lamp or two. At no fault to the owners, as we are having a heatwave in Europe at the moment, it was a bit on the warm side upon going to sleep but it quickly cooled down to the point a duvet was necessary. Also, there was a wedding going on (which owners had let us know) which woke us up at about 3am with the Djs music. But otherwise we slept great. Beds very comfortable. We were disappointed that we had reserved a room within the chateau and were put in an extension room completely separate from the chateau. It was like staying in a self catering apt which was not our intension and left us feeling completely isolated from the chateau. The room was spacious with a large bathroom, Although, the jacuzzi bath did not work properly as the air intake knob has ceased. I found the bed uncomfortable as the mattress was very hard. My husband thought it was Ok. The TV did not have any international channels, other than BBC and CNN News and the other relevant channels did not convert to the original Language which is now a very common feature in hotels and quite frustrating for my husband who does not understand French. Unfortunately, due to suffering from food poisoning from a restaurant the night before arriving, I was not well enough and we could not experience the gastronomic restaurant. Based on the above, overall, the overnight stay was disappointing, especially due to not having experienced staying in the actual chateau. We did however appreciate that we had called ahead to request an earlier check in than the official 4pm due to me not being well and our room was ready. Our advice is to double check with the chateau in advance that you are getting the room you believe you actually booked. On check out, I mentioned our disappointment to the gentlemen on reception regarding not being in the chateau and being quite dismissive, he remarked, ‘the rooms are all the same’ followed by the bill and pointing out ‘this is your half price room rate’. So unprofessional and to be honest rude! They set the rates. Price of room very reasonable, but everything was then an extra charge, like breakfast and spa. Better to be honest and charge more but include from the start. Add spa and breakfast almost doubles the rate. 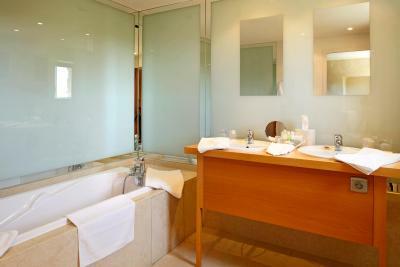 The spa was very small and jacuzzi not very hot - and not included in the price of the room so expect to pay more. The food in the restaurant was good - really delicious - but it wasn’t cheap. There’s nowhere near to have an evening meal and so you have to eat there. Breakfast was very average and not cheap - check to make sure it’s included in your price. Overall it’s ok, but overpriced for what you get.